Shakeel Jeeawoody is VP of marketing at Blue Pearl. I enjoyed a long conversation with Shakeel at SAME Forum in France in October, and again at ARM TechCon in November. We completed the discussion by phone this week, starting with a brief profile of Blue Pearl and a discussion of FPGA versus ASIC design needs. Per Jeeawoody, “Blue Pearl has been around since 2005, we’re located in Santa Clara, and our technology has all been developed in-house. Our underlying technology improves RTL analysis using symbolic simulation techniques and adapting them to our customers’ market requirements. 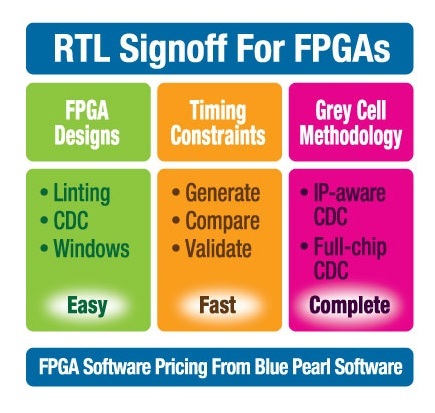 We have competitors in the linting and clock-domain crossing [CDC] space, but not many that can generate SDC constraints and offer easy-to-use tools that run on Windows at an attractive price point to support FPGA designers. “More FPGA designers today struggle with IP integration in their projects in the same way ASIC designers have in the past; if they don’t do the right level of analysis, there are reliability problems in the field. With that in mind, we focus on addressing emerging and major FPGA design issues – one we call Grey Cell Methodology, and we offer mode-based analysis to address issues associated with longest path analysis. “By adapting our Grey Cell methodology, IP providers can take their IP and give enough information for inter-IP analysis without exposing their secret sauce. From the input to the first flip-flop and from the last flip-flop to the output, only enough information is given to the user to make it possible to do better analysis of their clock domain crossing and multi-cycle paths. “Most people need help with clock domain crossing, or at least have reliability issues with CDC in the field, since the number of clocks in designs is increasing rapidly. Having a Grey Cell helps integrate IP with a design’s RTL and supports inter-IP analysis. Then a designer doesn’t have to carry a lot of data for analysis and can do full-chip CDC analysis, which will [in turn] reduce reliability issues in the field. Is Blue Pearl focused only on FPGAs, I asked. Given this increased tool capability, how close are we to seeing FPGAs used as end products? Along with Adacsys, Blue Pearl made a joint presentation at SAME. Why? Shakeel said, “That presentation at SAME was all about helping designers get their design into a position for hardware validation as soon as possible. Blue Pearl is involved in the front end, while Adacsys is in the back end. Our joint talk at SAME was about getting to the validation phase as quickly as possible. We talked about linting, using our tools for SDC generation, to check the design for a specific methodology, and a methodology flow that reduces design iterations – all tied to specific applications, things like military and transportation. What specific methodologies are you referring to? Shakeel said, “For industrial applications, there are a certain number of checks that need to be done – for example, the way you implement a global reset can be resource intensive, so you need to check how you’re implementing them in the design, so you’re not over using resources or implementing a function in too many levels of logic. Now that Synopsys owns Synplicity’s toolset, are they the competition? Given the confidence projected by the company and the aggressive conference schedule they are pursuing, expect to see a lot more from Blue Pearl, not just at DesignCon, but throughout the coming year and beyond. This entry was posted on Thursday, December 6th, 2012 at 11:38 pm. You can follow any responses to this entry through the RSS 2.0 feed. You can leave a response, or trackback from your own site.